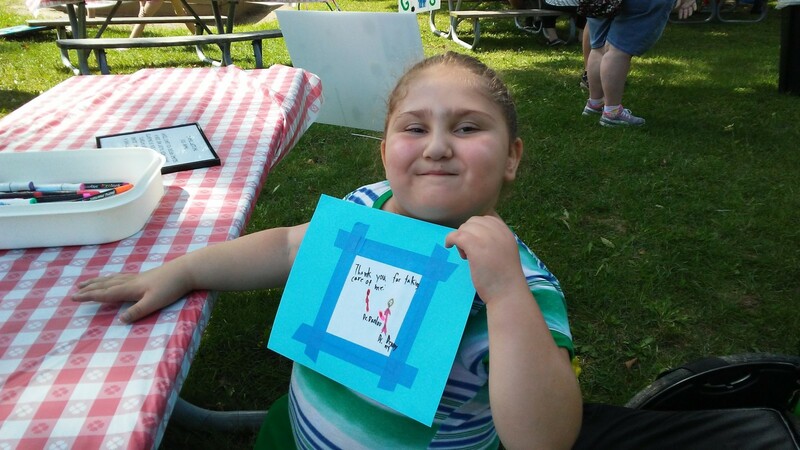 We’ve gone to the Herma Heart Center and Special Needs picnics for years now, but we didn’t even know (or at least I didn’t) that the Cleft Palate Clinic even had an annual picnic. One of the hospital employees invited us at Namine’s last appointment, and how could we say no? The picnic was actually held at the same place as the Special Needs picnic. But while the SP picnic is held inside, this one was outside. Grass makes for tricky navigating with a wheelchair, but it’s not our first rodeo. We arrived a little early, so Namine played on the playground for a while. It was accessible too, with ramps everywhere. The team would like to make a wall quilt using an art square made by each of our patients. Please have your son or daughter share their talent and sign a square before you leave today! Namine drew the two doctors from the team that she knew best: Dr. Denny, her plastic surgeon, and Dr. Vanloo, her speech pathologist. 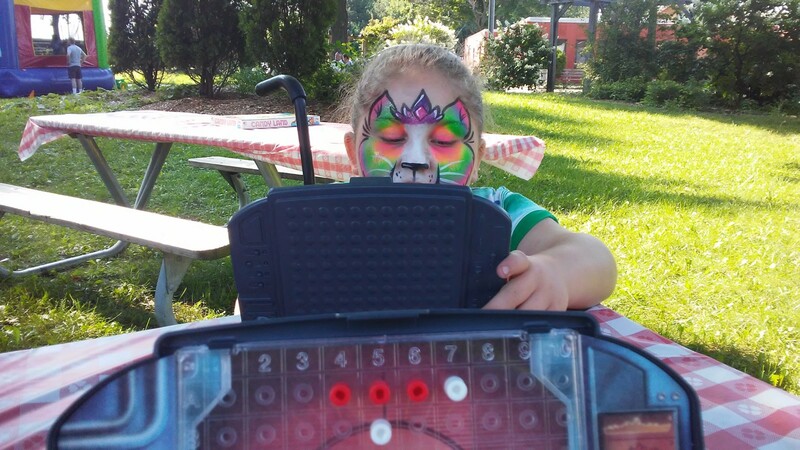 And what picnic would be complete without a face painting? Namine is usually content to accept whatever the painter does — and she’s pretty comfortable with anything, having had a butterfly, Batman, a crown, and a dinosaur. 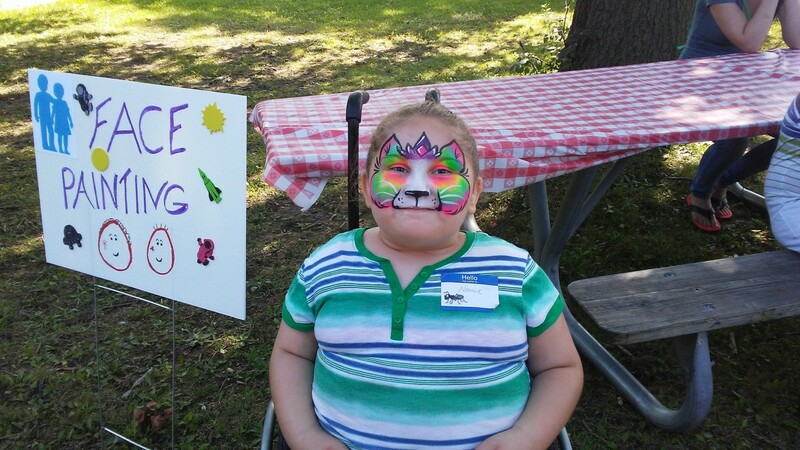 But this time her request threw the face painter for a loop: she wanted a princess rainbow kitty. The artist wasn’t stumped, though. We think she did an excellent job. They also had board games at the picnic, and we played Candy Land a couple times. (At least my wife and daughter don’t take advantage of my color blindness, unlike some people I know. We won’t mention any names, will we, Matthew?) When that was done, I grabbed Battleship. Jessica and I played a game, while Namine watched. Namine grasped the rules and concept pretty quickly, and without needing much explanation from either of us. It was timely, actually; she’d just learned about matrices in math class, so identifying coordinates was pretty fresh in her mind. After my game with Jessica was over, Namine challenged me to a game against her. Namine and I were almost done with our game — it was close, she’d sunk three of my ships, and I was in the middle of sinking her fourth — when Jessica and I noticed that the bounce house was empty but not yet taken down. (We hadn’t wanted Namine to go in while it was full of crazy children, and she had agreed.) Jessica asked Namine if she wanted to cut the game short, so she could go play in the bounce house. Of course she said yes!